The MD-83 plane, carrying 72 passengers and crew members, en route from the northern Saudi city of Tabuk to Quetta in Pakistan had to divert to Karachi International Airport, Sunday today when when the pilot sensed some problems with its landing gear. "The aircraft made an emergency belly landing. 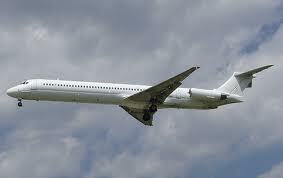 All 72 passengers and crew remained safe," a local television news channel reports. The plane was a chartered flight from Saudi Arabian city of Tabuk to Quetta in Pakistan.